Head on up to Santa Cruz, another college town (with a REAL UC) with pretty decent weather and the immediate coast to boot. There you will find the exact same issues of transients and otherwise homeless. Also not allowing on-street camping in an RV. Walk around downtown SC and if you aren’t soon disgusted, your tolerance for this kind of nonsense is far greater than mine. “REAL UC”? Maybe, University of California Second Choice with a promise to transfer to a REAL UC in two years if you haven’t fried your brain. Santa Cruz started the SLO transient boom by offering free bus tickets to SLO. The problem with shelters are that they have to be drug, alcohol, and insanity free to function. That is not serving the “needs” of much of the homeless population. I say put them ALL in San Francisco and turn the city into a giant homeless camp intermingled with the nations highest rent. It can be their “sanctuary city”. Sleep deprivation is a form of torture. Very specific. The Council on Human Rights and the United Nations Convention Against Torture have outlined this unequivocally. The SLO ordinance is a TORTURE doctrine, in violation of humanity. Just ban vehicles …any vehicles, from entering and parking within city limits and they’ll be on firmer legal grounds. They could do that. I’m sure that the business lobbies would applaud. Unlike the stereotype of a typical homeless person demonstrated by most comments regarding my article, a significant percentage (no, not all!) of homeless people are ashamed and embarrassed at being homeless and try their best to HIDE IT from their friends and family – they certainly are not out aggressively panhandling or holding a sign on a street corner. These people that have nowhere else to go either go to the shelter (which is often full) or the streets. When they try to sleep in a in creek bed, they awaken at every twig snapping, afraid that they will be rousted by law enforcement or attacked, robbed or raped – they tell me they cannot get a halfway decent night’s sleep. Everyone has an opinion but those who have someone camping in front their house, watching them come and go, may have a problem. Maybe roadside camping should be limited to the curb in front of public buildings, police stations, library, court house etc. That’s a very interesting comment because one of the things that the homeless most worry about is who is watching THEM come and go. Maybe they’re parking in front of your house because it feels like a low-profile, inconspicuous spot. Maybe you just live in a nice quiet neighborhood where they won’t be harassed. Do you have a nice shade tree they are parking under, perhaps? something for the government to do and raise money from the poor so they can have salaries. A stupid damned ordinance! The “let’s make it illegal so it will stop” logic was and is used with drugs as well. (It was also used with alcohol in the past.) All it has cost is thousands of lives and billions of dollars. Take a drive through the City of SLO sometime. More and more it feels like a police-state. Too many cops in their cartoon cars (and wasteful SUVs!) driving around looking for ways to justify their existences. This ordinance is just another tool to help them do that. What a cruel, useless and wasteful ordinance. WOW ! We agree on something. I question the language that is used here. How is resting or sleeping in one’s own vehicle construed as ‘camping’ ? Haphazard tents and campfires with resultant trash I can understand needs to be policed, and ( get THIS ‘conservatives’ ) REGULATED. But sleeping ? C’mon …people that are sleeping peacefully pose no threat to others. 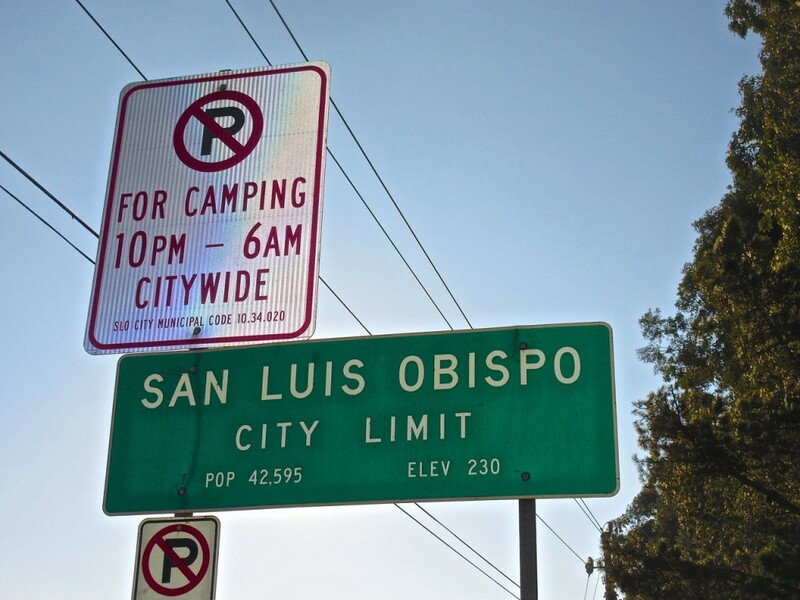 Ninety-nine criminal citations were dismissed thanks to the intervention of the San Luis Obispo Homeless Alliance. Dozens of people in the California city had been accused of the crime of sleeping in their cars, but a judge found the city’s law against vehicular sleeping to be unconstitutional, and awarded a payout of $134,000, which all went to the lawyers. Don’t like it? You should move. Hard to move from one home to another when you’re HOMEless. Sorry, this article is totally off the mark. As someone who has lived here most of my life, and worked hard to live here, I see the problem completely differently. The problem is we (the Central Coast, but California specifically) is being overwhelmed by the nation’s homeless mainly because of our weather, but also because of the attitudes of people such as Mr. Waag. Believe it or not, other cities around the country are busing their homeless to California, and other cities in California are busing homeless and giving them train tickets to SLO- I have proof of this, as I work in the transportation industry. We are being actively, and intentionally invaded with homeless people, many of them mentally ill- You may have seen the man barking at himself, pushing the shopping cart around town? He’s a rather new arrival.. there will be more of his type soon though. I remember SLO about 15 years ago, with no homeless anywhere, then they started showing up, hearing about the great begging opportunities on Higuera and the good weather. The also found out there are a bunch of bleeding hearts in this town who are willing to let them do whatever they want. Now Foothill Blvd. is becoming a big homeless hangout: With shopping carts in hand as well.. nobody ever tells them to stop stealing apparently. I am guessing you don’t live near an impacted street with RV campers leaving their garbage around, or a park that is constantly filled with the exact same smoking, drinking and drugged out homeless people every day Mr. Waag? Are we supposed to let homeless camps develop in our parks now, and let drug addicts have free reign 24 hours a day? I think not. So, we are supposed to not only deal with the fall out of having these homeless people sitting around drinking all day, eating up our emergency resources and police calls for their constant drug and alcohol abuse (I would say more than 50 percent of the homeless population has a drug problem of some sort)- and have local shops close because nobody wants to go downtown to get hassled anymore, and not feel safe walking on our streets so you can feel good about helping the homeless? What happened to not stealing shopping carts? For a while our local homeless understood that steeling was “bad” and didn’t steel them, now they are littering the entire city, and homeless people walk around with 250 dollar plus shopping carts, never getting talked to by law enforcement.. They pretty much get to do whatever they want and never get in trouble for it because it’s “too much paperwork, and they won’t pay the ticket anyway.”- A college kid walks around as drunk or high as these homeless and they get a ticket, same with any other resident of this city, but not the homeless. Here’s a news flash: Homeless go where they can live their lifestyle, with as little work as is humanly possible. They will go to the areas with the nicest weather they can find. They don’t appear to care about housing costs, because hey- they aren’t planning on getting an apartment. To live in SLO county, pretty much anywhere you need to have a high paying job, and the means to support yourself. I would argue that by “enabling them” and keeping them around on the central coast- we are doing them a disservice, as if they lived in most other parts of the country they could afford the much cheaper rent, and also get a lower skilled jobs that one can live in an apartment or house with income from. By keeping them here in this “sheltering” system, more get attracted to the city, and after their month stay is up.. it’s time to move onto the parks. So basically, it’s like a conveyer belt bringing them here, and dumping them in our parks. We are being invaded by homeless in this city because there are a bunch of bleeding heart homeless advocates in this town. The interesting thing is- if we didn’t have Prado and Maxine, I doubt there would even be a homeless “problem” in this town, because they wouldn’t have all showed up in the first place. We are setting this town up to fail- oh, and Mr. Waag- I guess you didn’t hear SLO is building a mega-homeless shelter yet? I guess you hadn’t heard that we are doing exactly like you want and inviting even more homeless into our already overwhelmed city. Another interesting thing you maybe be overlooking regarding how it is our city is suddenly overwhelmed by strange homeless people: all have cellphones now and call their friends. The residents of SLO have to be protected from this onslaught which has already manifested itself in attacks on local residents by these insane homeless people, more who show up daily. Finally, why is it SLO disproportionately has to “take care of the nation’s and state’s homeless problem” and we aren’t building shelters evenly throughout the county (and state and country for that example) – The more services you provided the ever growing number of out-of state homeless people who show up, the more will show up, it’s that simple. If we are going to “tackle the homeless problem” by building more and more beds to lure in drug addicted, mentally ill homeless from other places, we should be building shelters in Cambria, Arroyo Grande, and Nipomo as well, to “spread out the love”- SLO has had enough. I will vote for whoever stands up to the insane Mega-Shelter the city is building and asks the police to do a better job telling homeless people they can’t steal, can’t smoke and drink and do drugs in the park, and need to keep moving along. The more comfortable you make them, and the more you provide them, the more will show up here (like we have seen in the last 15 years) and that’s irresponsible on our part, because they can’t, and won’t be able to support themselves in this area with the high rents, and skilled job market. If you want these people to get better, let them move to more affordable parts of the country where they have a much better chance of getting a roof over their head. This isn’t that place, and we’ve done more than enough already to accommodate our exploding non-native homeless population, perhaps it’s time to do less- Close Maxine, Close Prado, see how the situation is 4 years down the road. Resident, there’s too much here for me to coherently respond to, so I’ll make just a few brief points. SLO County surveys have shown that the majority of our homeless have ties to our community, meaning that they either grew up here, lived or worked here for some time, or have relatives that live here. The homeless are already here. Busing them to another community does not solve the problem, it just pushes it onto someone else – not really my style. Question for Resident: How does making them leave make the world a better place? Answer: it doesn’t. Resident, one more comment…you begin by saying that my article is “off the mark”. However, the point of the article is that we are indeed, criminalizing homelessness by making it illegal to even nap in your car on a public street. For whatever reason, some people have nowhere else to go, and people have to sleep or they will eventually die. The unpaid citations build up, turning people who have nowhere to live into criminals. Note also that city and county laws make it illegal to sleep in a car or RV on PRIVATE PROPERTY as well. Nothing in your comment dispute what I attempted to prove in my article. Since the Great Recession, we have seen way more families that are new to homelessness, due to loss of jobs that secure enough income to pay rent in expensive SLO county. Also, we see way more working homeless, because even full time minimum wage isn’t enough to pay for housing in our county (no, I’m not pushing for an increase in the minimum wage – that wasn’t my point). article written by a person who went out and interviewed homeless people in SLO. Thank You for caring enough to write this article. The problem of homelessness on the Central Coast is that the area is relatively safe and has good weather. So the homeless congregate here. I am all for helping local residents who temporarily do not have a place to stay and are down on their luck. But transients and the long term homeless who choose that lifestyle should be given a one way ticket to San Francisco where they will find a population that accepts drug use and human feces in public. Yes, let’s help the locals but if we build it they will come! It is a problem that can probably be solved by local churches and charities if city and local government gets out of the way. Yep. The day before Christmas, and there’s no room at the inn. Would you be willing to pay for that one-way ticket to San Fran? And if that person makes it back to SLO somehow, would you be willing to pay for them to be shipped back? Keep in mind that a heated bus, plane or train would be very attractive to an individual living in a car or sleeping in a creekbed – they could keep it going, just riding back and forth – they’d have safety and a little bathroom in the back of the bus to deposit their human feces in. How far would you be willing to take this? Might be cheaper just to let him or her rent your guest room. The cost of sending transients to the Tenderloin would be far cheaper than providing government services to them here. And in the Tenderloin neighborhood in SF, many homeless will enjoy because The Tenderloin provides a wealth of alcohol and drug abuse opportunities compared to SLO. SLO County is not the only place with good weather where the homeless congregate. Check out the weather and the homeless population in our adjacent counties: Monterey, Santa Barbara, and Ventura counties. They all have great weather, and assumedly, homeless problems (though I am not familiar with their exact homeless situation). Again, one way tickets don’t solve any problems, and don’t even keep them from coming back. Kaiser Bill may cheer the “one way ticket” solution, but those who live in their “landing zone” won’t be thanking you. Whatever happened to “doing the other person right” (as my grandparents used to say)? If you don’t like sending transients to SF, then send them back to their home town.